Does anyone else see anything wrong with this picture? 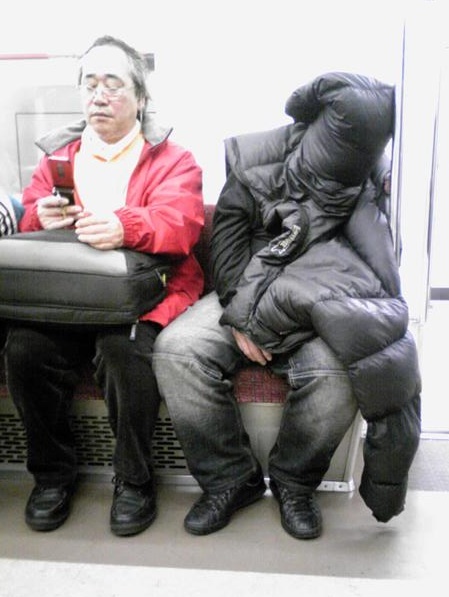 A guy is sitting on the train with his head shoved up the sleeve of his jacket and the guy next to him is busy emailing, or reading the news… totally oblivious to the situation. The entire time I am thinking… whether he is in trouble. Maybe he has accidently gotten his head stuck up his sleeve and fainted because of overheating. I mean it must be very hot inside the sleeve of a down jacket. But on the other hand, maybe I have turned a little Japanesey and am afraid to draw attention to myself by approaching others and engaging in a little human interaction. In any case, I hope that this guy made it home safely. Who knows… maybe he’s on to something and this could be the next “big thing” in the world of fashion. Wow! I have just stumbled upon this site and I am just totally in love with your blog. You put a really fun perspective on Asian fashion!